Rogaška Slatina is a place of glass production and the unique mineral water Donat Mg. The promenade located between Secession buildings has been connecting the famous health resort with the world-class medical centre for centuries. Pleasant walking trails invite you into nature. Here, where you stand, is the source of health and true divine power. Instead of Hippocrene, drink Roitschocrene, the Rogaška spring, which is before you! Apollo, the legend of the creation of the Rogaška spring from the 17th century. Rogaška Slatina is a unique place in the world due to the Donat Mg spring. Donat Mg contains more magnesium than any other water in the world. Every step you take, you will be surprised by Slovenia’s natural and cultural gems. Are you interested in what you need to see in Rogaška Slatina? 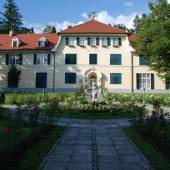 The collections at Ana’s Mansion Museum take visitors through the prism of the past and the present of Rogaška Slatina. This is one of the largest glass factories in the world, with the largest number of glass blowers and manual glass grinders. Its crystal products are renowned all around the world. 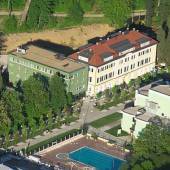 The hall that charmed the emperors of Austria-Hungary in the past is a special feature of the former Health Centre, now the Grand Hotel Rogaška. Numerous events are held here, the most prestigious one is Anna's Ball. This is the work of the renowned academic painter and sculptor Vasilij Ćetković Vasko. In Rogaška Slatina, Pegasus is an important historical and cultural symbol. Legend has it that he discovered the mineral springs of Rogaška. The central part of Rogaška Slatina is the Spa Park which is the heart of the spa complex together with the promenade. Due to its unique mineral water, Rogaška Slatina is a source of health and well-being. See for yourselves. Fresh energy is provided by activities in the surrounding nature and through meeting friendly locals who will offer you a glass of local wine and home-made goods. Taste the thing that has attracted those who thirst for health to Rogaška Slatina for centuries. The unique therapeutic mineral water source – Donat Mg – is at the very top in the world when it comes to water with magnesium content. Its rich mineral consistency gives the mineral water its healing power. Feel its positive effects by taking a mineral bath or enjoying a drinking treatment that will help you achieve better health and well-being. Relax by taking a stroll down the promenade of the Spa Park in the heart of Rogaška Slatina. Walking in the shade of the mighty avenue of sycamores and horse chestnuts has a special charm, it calms us and contributes to our well-being. Be revitalised by nature's energy by hiking to the dramatic peaks in the immediate vicinity, which can be reached on 9 hiking trails with various levels of difficulty. Discover the power of touch by surrendering to the hands of experienced massage therapists, being carefree, and enjoying some pampering. Experience the beneficial effect of mineral baths and revitalising saunas. 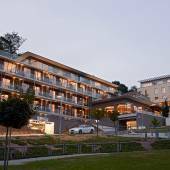 Treat yourselves to endless pampering in Rogaška's pools and wellness centres, where you can find a mix of the beneficial effect of the Rogaška mineral and thermal water and the intimacy of world-class relaxation services. Trust the experts at Rogaška Medical Centre, where holistic, professional, and individual medical treatment is provided. The main goal is your well-being, which is catered to by our experts in the fields of balneotherapy, physical therapy, and massage therapy, experts in specialist examinations and diagnostics, surgery, rejuvenation, beauty, and nutrition consultations. Eliminate the results of stress, improper nutrition, and excessively quick pace of life. Rejuvenate body and soul by enjoying beauty treatments performed by our experts using natural cosmetics. The most effective, non-invasive, and pleasant treatments with long-lasting effects and modern technology are available. The trustworthy Afrodita cosmetics line is the goddess of beauty in Rogaška Slatina. When you enter Anna’s Mansion, you will be left breathless when you see the event hall, and walking through it will take you through five themed museum collections: a glass collection, a local studies’ collection with a collection of autographs, a park collection, and a water collection. This is the right place for you to re-live and taste the tradition and learn about the main attractions of Rogaška Slatina. The Rogaška Glass Factory is the largest manual crystal production facility in the world. Come for a visit and see in person how crystal, known for its clear appearance, brilliance, and musical sound, is made with the power of fire, in the creative hands of glass blowers and glass grinders. 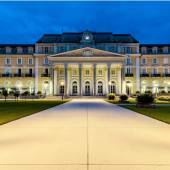 Also visit the Crystal Hall at the Grand Hotel Rogaška, where you can admire hand-made crystal chandeliers. Hop on your bike and explore the surrounding area of this health resort. You will find interesting and exciting cycling trails that are ideal for every type of cyclist, as you can see numerous natural and cultural landmarks along the way. For example, you can take a ride to Lake Vonarje on the popular cycling trail between Rogaška Slatina and Podčetrtek. Allow yourselves to be seduced by a world of refined tastes in the wine cellars of Rogaška Slatina. Experienced wine connoisseurs and wine tasting experts will introduce you to the wealth of tastes of the wines made in this area. 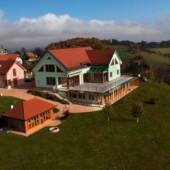 Head on a trip down the Rogaška Wine Road, stopping at tourist farms, where you will not only be able to taste local wine, but other culinary specialities as well, such as home-made cured meat products, bread, natural juices, and pastries. In the village of Jurg in the midst of the gentle wine-growing hills of the Kozjansko region, you can find a restaurant of the same name. Its cuisine is based on traditional local dishes, but it also follows the most modern gastronomic trends. The restaurant’s dishes are seasonal and complemented by the world-class wines made by wine-growers from the surrounding hills. Feel the cultural and fun vibe in all seasons. Anna's Festival invites you to enjoy classical, jazz, and pop music evenings in the summer in the centre of Rogaška Slatina, while you can warm up enjoying some dance rhythms at the Crystal Village in winter. 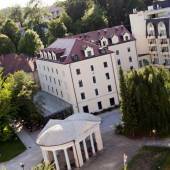 Fun moments in the company of others can be experiences in Rogaška's hotels by hotel guests and other guests. Visit Casino Fontana and open your fountain of happiness. Rogaška Slatina's Spa Park is adorned by no fewer than 4500 common boxwoods, 7400 annual plants, 7500 perennial plants, and 700 roses. The total surface area of the park covers 10,000 m2. Due to the uniqueness, diversity, and multitude of natural assets, the general area of Mt Boč is protected as a landscape park, and the vast majority of the area is also included in the European ecological network called NATURA 2000. The symbol of Mt Boč is a rare plant, the protected greater pasque flower (in Slovenia known as Velikonočnica or Easter flower) with gentle violet flowers, which is usually in bloom around Easter. In the area of Rogaška Slatina, you can find rare trees, such as the ginkgo or the sorb tree, the fruits of which are highly valued. The mlinci (Slovenian flatbread) potica cake is a culinary speciality from the villages surrounding Rogaška Slatina. Once, it was made only for Easter, and this was a big event in the village. It consists of three to five mlinci flatbreads and a walnut filling or an egg cheese filling. The mlinci Potica cake was once prepared on a baking paddle and baked in a wood-burning oven, so it is round in shape. The GAJA association still bakes the Easter mlinci Potica cake using the same recipe as our forebears, and it is a kind of a trademark of this association. Rogaška Slatina a unique health resort with a 400-year tradition of knowledge and experience combined with the spirit of modernity. 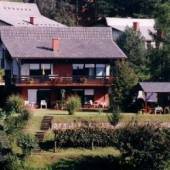 Make your holiday in Rogaška Slatina even better by taking short trips to the surrounding area. When you visit Podčetrtek, a village 15 km away, to which a well-maintained cycling trail can lead you, also find the little village of Olimje, where you can visit an old pharmacy and the Olimje monastery, satisfy your sweet tooth by eating chocolate, and taste the local beer. 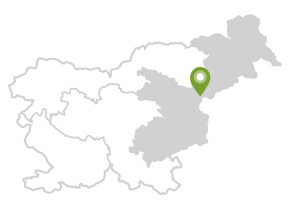 Ptuj – the oldest town in Slovenia – is just 45 km away. There, you can experience history, from Antiquity to the present, and you can meet the Kurent, a Carnival character. If you head 35 km to the west of Rogaška Slatina, you can visit another historical town – Celje – where you can go up to the Old Castle, see the remains of the Roman town of Celeia, or hike up to Celjska Koča, a popular hiking destination. If you wish to enjoy some activities in nature, a quick trip to Rogla, a mountain 45 km away, is just the right choice for you. In winter, you can go skiing, and in summer you can explore the nature of the Pohorje Hills in your hiking boots or by bicycle. Ptuj is one of Slovenia’s oldest towns, famous for the Kurent, a traditional carnival figure. Celje, an urban hub boasting a remarkable history of the Counts of Celje and a unique castle. For more information visit the Rogaška Slatina website.